Round 1: Tsurkan having trouble catching Martirosyan. Martirosyan uses his jab. Martirosyan lands a right uppercut-straight right combination. Toward the end of the round, Martirosyan hits Tsurkan with a counter left hook. Round 2: Martirosyan nails Tsurkan with a left uppercut to the head followed by an overhand right. Tsurkan hit Martirosyan with an overhand right. Martirosyan circles firing the jab. Huge difference in each fighter's hand speed. Round 3: Martirosyan circles and throws his jab. Martirosyan stuns Tsurkan with a left hook to the head. Martirosyan lands a right uppercut to the head followed by an overhand right. As each round goes on, Martirosyan is landing more punches. Tsurkan gets tagged by a left uppercut - right hand combination from Martirosyan. Round 4: Tsurkan hits Martirosyan with a left hook to the head. Martirosyan counters with a right uppercut. A right hand from Martirosyan buckles Tsurkan. Martirosyan makes Tsurkan stumble again after landing a right hand shot. Martirosyan lands a left hook to the body and followed it up with an overhand right. Round 5: Martirosyan stuns Tsurkan with a right hand shot and then pushes Tsurkan back. Martirosyan is throwing combinations off his jab. Round 6: Martirosyan found his range very well in this fight. Martirosyan lands a right uppercut. Tsurkan jabs and continues to press forward. Tsurkan can't seem to hit Martirosyan with a clean shot. Overall Summary: Vanes Martirosyan landed the cleaner and more effective punches throughout this fight. He continually beat Andrey Tsurkan to the punch. Tsurkan did not possess the hand speed to counter Martirosyan. Tsurkan tried very hard, but just could not deal with Martirosyan's combinations or ring generalship. Martirosyan boxed extremely well and was never in range to be hit. Tsurkan was simply too slow to catch this Armenian born light-middleweight. 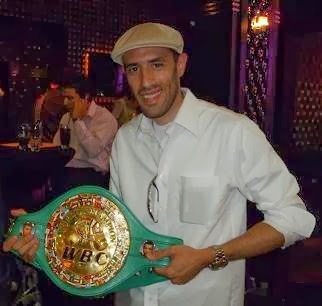 Vanes Martirosyan represented the U.S.A. at the 2004 Olympic games as a welterweight. Martirosyan remains undefeated with a record of 25-0, 16 KO's. Andrey Tsurkan's record falls to 26-5, 17 KO's.